What's harder–watching someone descend into a pit of lysergic madness, or watching someone mellow out of it over the decades? Grace Slick made this question a little easier to figure out yesterday when, with California Governor Arnold Schwarzenegger and the CEO of Virgin America (a U.S. branch of Virgin Atlantic that hasn't started flying yet) on hand, she dedicated the airline's corporate headquarters in San Francisco and a special jet named, you guessed it, Jefferson Airplane. A photo running with the Associated Press story on the dedication shows Slick presenting San Francisco Mayor Gavin Newsom (who also attended) with a portrait of Newsom against the backdrop of the Golden Gate Bridge. 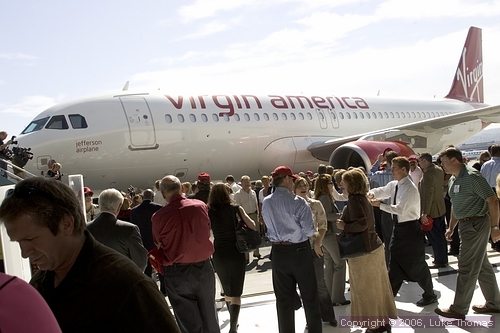 OK, so it's hard to separate Jefferson Airplane from San Francisco, but that's as visually disappointing as Virgin's "Jefferson" jet itself, which sports the airline's standard white-and-red paint job and "Jefferson Airplane" stenciled in tastefully below the cockpit. Whatever happened to the whimsical, psychedelic flying machines of old?